Deer and turkey hunters have the opportunity to attend a pretty neat show this month with a chance to see the latest technology and gadgets in their sport. 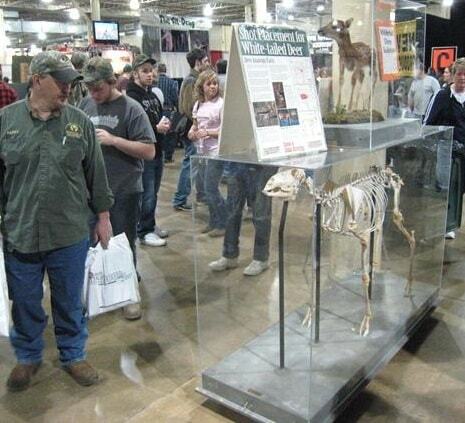 The annual Deer and Turkey Expo returns March 17 through March 19 at the state fairgrounds in Columbus. This has grown into a very popular annual event in Ohio and thousands of deer and turkey hunters migrate to this show to see what the vendors have to offer. Deer hunters can have their monster bucks officially scored for a small fee and turkey hunters can pick up the latest in decoys, calls, and camouflage clothing. Skip the lines and purchase your discounted tickets online before you go. • Classroom teachers and other members of school communities who are interested in becoming certified National Archery in the Schools Program instructors are invited to attend a free training workshop Saturday, March 25, in Hancock County according to the Ohio Department of Natural Resources. The Basic Archery Instructor Training will take place from 8 a.m. to 4 p.m. at the ODNR Division of Wildlife District Two office located at 952 Lima Avenue, Findlay, 45840. Preregistration is required by March 24 and those interested should visit naspbai.org to sign up for the course. Participants are encouraged to bring a packed lunch. NASP instructors teach target archery to elementary, middle and high school students, within the school gym. The curriculum covers archery, safety, equipment, technique, concentration skills and self-improvement. When students are introduced to the sport of archery, the in-school educational component is only the beginning. Many NASP-participating schools then start after-school programs and archery teams. The NASP program is rapidly growing and popular among both students and educators. It was introduced into 12 Ohio schools in 2004. More than 900 Ohio schools now have teachers certified to instruct target archery. Over 30,000 Ohio students participated in NASP as part of their physical education curriculum during the 2015-2016 school year. The first NASP program was launched in Kentucky in 2002. Since that date, 47 U.S. states and 11 foreign countries have adopted it. For additional details regarding NASP in northwest Ohio, visit wildohio.gov or contact the Wildlife District Two Office at 419-424-5000 for more information. • Ohio wildlife biologists are frequently contacted by concerned residents who spot coyotes in urban or suburban areas. Understand that coyotes are common throughout Ohio’s 88 counties and are regularly seen within city limits. Read more about coyotes at wildohio.gov. Wolves are not a species found in the wild in Ohio. If you spot a coyote on your property, make sure to remove all “attractants” to deter the coyote from returning. This includes properly securing garbage and removing outside pet food primarily before nightfall. Remember to clean up around the grill as well. Do not feed coyotes directly. Coyotes prey primarily on small mammals such as rabbits and rodents. However, interactions with domestic pets do occur sometimes. Keep small dogs and cats inside (especially between sunset and sunrise) or leashed when outside. Motion-sensitive lighting tends to be helpful too at keeping wildlife away from your home. Occasionally, an inquisitive coyote will stay put and watch you curiously. Make noise. Clap your hands and shout; the coyote will likely move on at this point. If it doesn’t, bang pots or pan together for louder noises. A coyote that loses its fear of humans can potentially become a threat. If a coyote visiting your yard does not respond to harassment techniques such as loud noises or it is presenting a conflict even after attractants are removed, contact a licensed nuisance trapper. You can locate a trapper at wildohio.gov or by calling the ODNR Division of Wildlife at 1-800-WILDLIFE. Nuisance trappers use highly regulated techniques to target individual animals and to reduce urban wildlife conflicts. Coyote populations in rural areas can be managed through legal hunting and trapping methods. Consult the yearly “Ohio Hunting and Trapping Regulations” digest for more information.